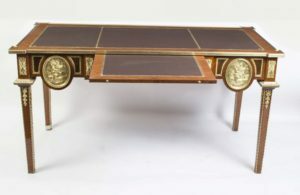 Dating from the last quarter of the 20th century, this is a lovely example of an Empire style walnut rosewood writing table. 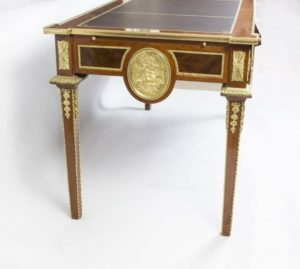 This walnut rosewood writing table has beautiful ormolu mounts and a tooled leather writing surface featuring a Grecian ‘key’ pattern. There are also large circular ormolu plaques around the rim which really typify the styling of the Empire period. There is a pull out writing surface adding additional writing space. The drawers are lockable and come with keys. 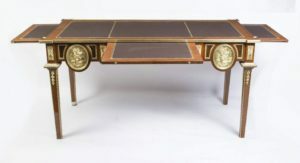 Very reminiscent of the Empire style, this walnut rosewood writing table is very formal with straight edges, abrupt corners and tapering legs braided with ormolu mounts. 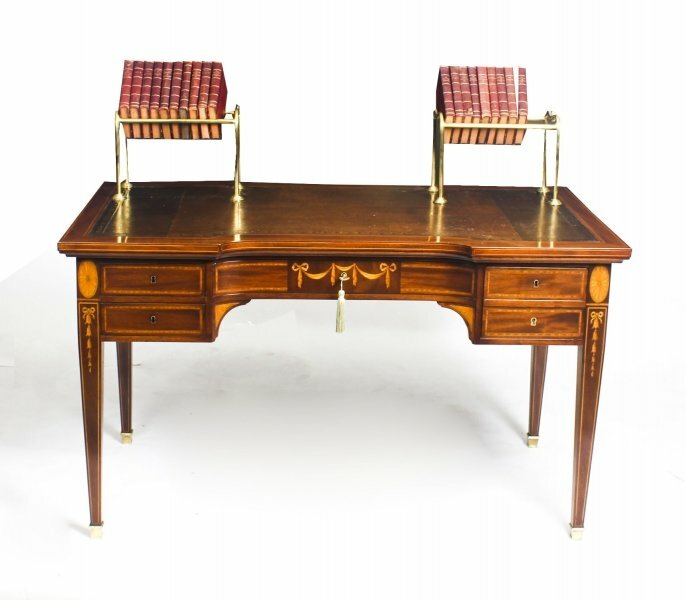 It’s a good idea to see valuable pieces such as this walnut rosewood writing table face-to-face before you purchase. Being mindful of this, we are always glad to greet customers in our North London showroom so you can look at this excellent walnut rosewood writing table for yourself. 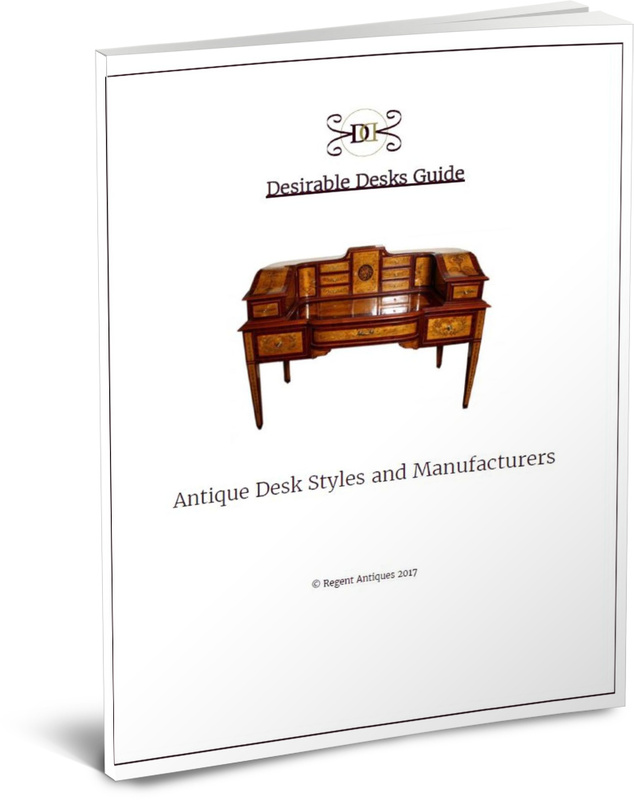 When you are here you can look over our comprehensive variety of other amazing wares and also discuss any queries or concerns that you might have. 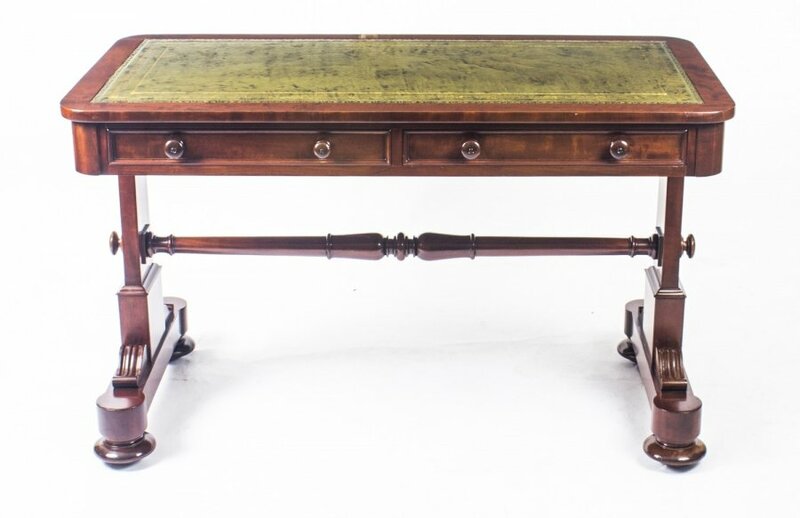 Our in house advisors are available to you to reply to queries, not only about this walnut rosewood writing table but also about antiques and collectibles more generally. They’ve a significant amount of specialist knowledge and are always happy to advise. Please call in ahead of time to get an appointment so that we can be certain we have the right specialist on hand to support you. We sometimes open on Saturdays, so if you want to come at a weekend, please get in touch to make sure that we will be open. We would not want you making a pointless journey. When making contact with us please make sure that you have the item reference number to hand (00693) so we can make certain which precise object you are looking to speak about. 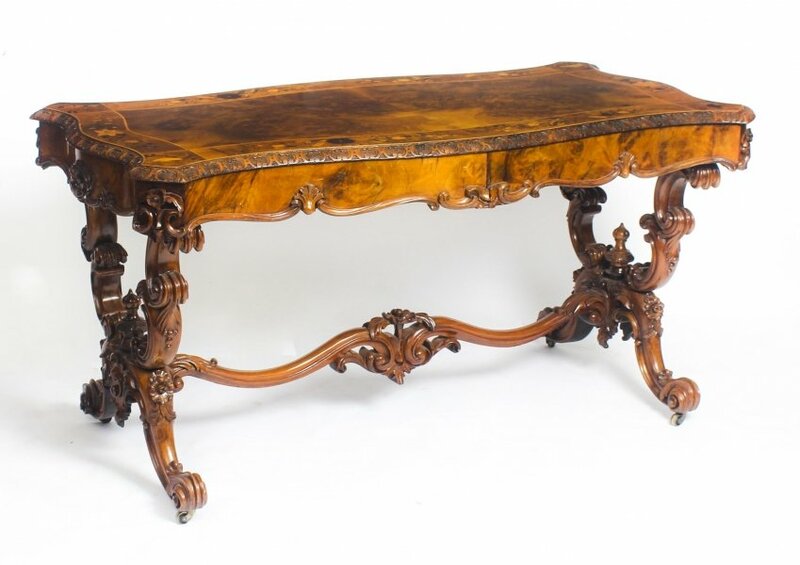 If you’re unable to visit, then we are always delighted to help answer any questions you may have about this walnut rosewood writing table by email or phone. We have in-house advisors who will be delighted to support you with any aspect of your intended purchase, so why not take the opportunity to get more info. When you make contact please make sure you quote the item reference number so we know which of our numerous objects you are talking about. You can get both our email address and our phone number by following the ‘Find Out More’ button. 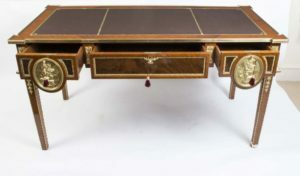 Fine objects such as this walnut rosewood writing table need skillful packing and shipping to ensure they arrive in the same condition that they left us. We take great great pride in our shipping experience and can send to virtually any location worldwide. However, we ask you to make contact to review arrangements and get a quotation prior to making any acquisitions, as we want to be sure that we can satisfy all your transportation requirements. As you will understand, some items call for sensitive handling and we want to ensure that that everything is available to get it to you safely and securely. 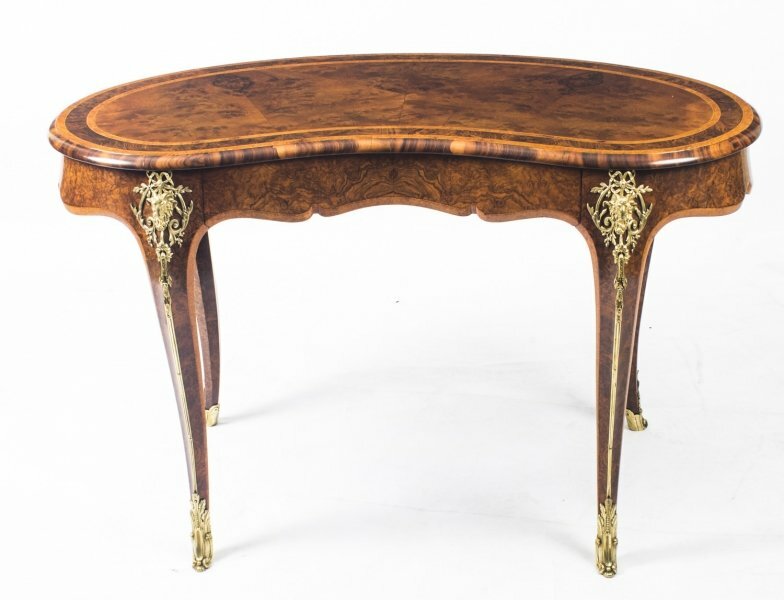 Please quote the item reference number (00693) for this walnut rosewood writing table when getting in touch so we know exactly what the shipping requirements will encompass. 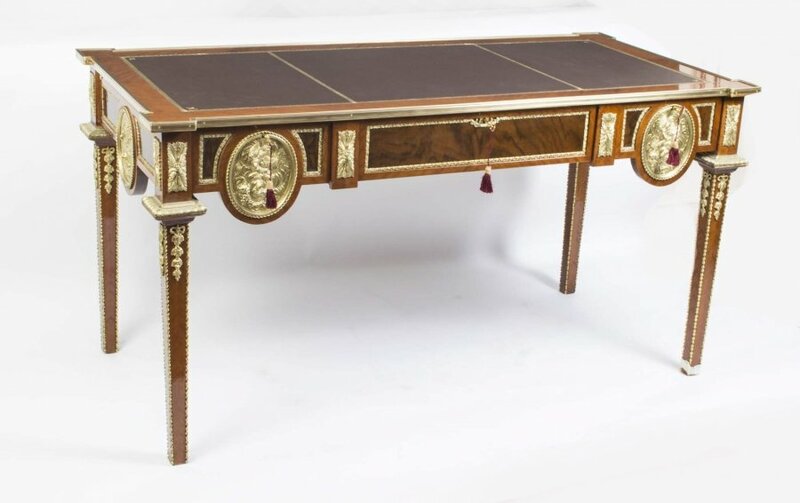 If you are not happy with this walnut rosewood writing table, we offer a 14 day money-back guarantee in compliance with the Distance Selling Regulations. If you do want to return it, you will be needing to pay the return shipping charges, unless we sent you something materially different to what you were anticipating or have mis described it in some material way. You must return the product back in its’ original condition and packaging. You’re also responsible for any customs duties, taxes or fees that become due outside the European Union.